One of the wonderful things about many natural and green brands is that they give back to worthy causes. When I heard about the latest product from Pink and Green Skincare and the fact that they were partnering with Safe from Slavery an anti-trafficking charity, I was keen to find out more. I have featured Pink and Green skincare before on the blog (see my review of the eye serum – here). Founded by Carol Aplin in 2014, the brand promotes self care for women and uses natural and organic ingredients in their formulas. Carol discovered the charity Safe from Slavery whilst attending a regional business meeting and was shocked to hear about the prevalence of sexual slavery in the UK. I also recently became aware of this topic thanks to this graphic and distressing article written by a victim of modern slavery which you can read – here (Please note the article contains a graphic account, including sexual violence). The article had a profound effect on me, especially as the mother of a young child, because thinking back to my own teenage years that could easily been my story, or one of my friends. This idea that it will never happen to you is comforting in a scary world, but talking about the topic is incredibly important to bring this kind of violent slavery to an end. Due to the high levels of trauma experienced by victims, a long term therapy approach is required to be effective. A percentage of every sale of the Marzipan body soufflé will be donated to fund this long term therapeutic approach. 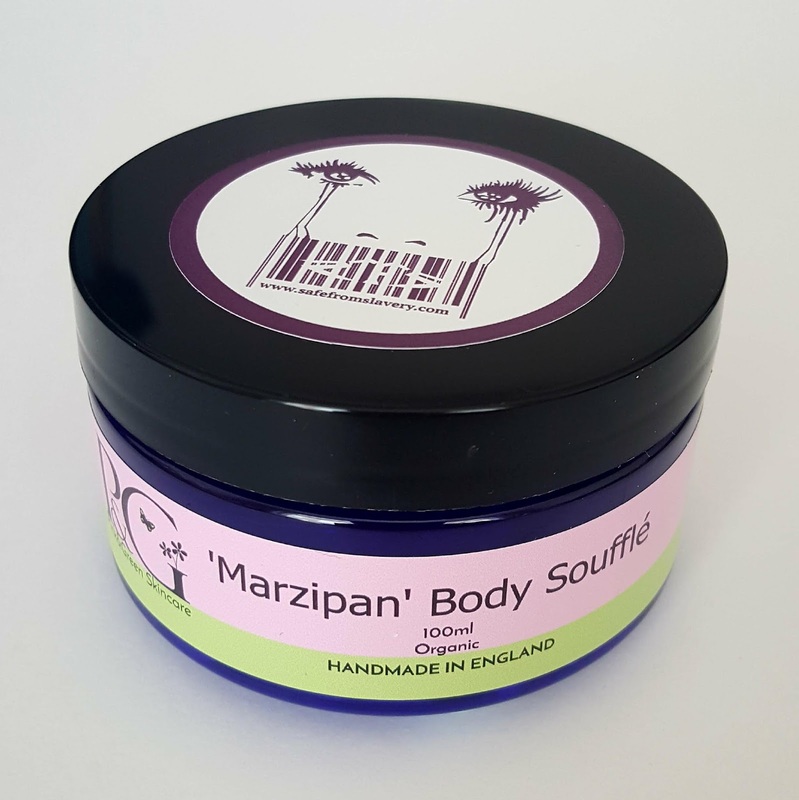 You can find the Marzipan body soufflé here (£14.95 for 100 ml) and it features rich Shea Butter and Plum kernel oil to nourish and protect the skin. You can find out more about Safe from Slavery and the excellent work they do at safefromslavery.com.